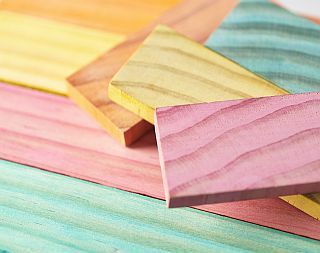 Staining or painting timber is the traditional way to add colour to wooden products, but that colour is only surface deep. Any scratching or resurfacing can remove the colourful layer and affect the aesthetic of the wood. The full thickness colour technology developed by Scion fixes colourful dye throughout timber in a range of bright colours. The full thickness colour technology colours every fibre in a piece of timber. At present there is nothing like this product on the market and, when coupled with wood hardening, the improvements could increase the value of New Zealand’s soft pine-based wood product industry. This would also increase onshore processing and spread benefits across regional New Zealand through job creation. Calling the technology ‘full thickness colour’ is not something the research team take for granted. Dr Elizabeth Dunningham explains the team has been working with a variety of different dyes over six years to achieve what is now a consistent, bright and non-leaching colour suitable for anything from furniture to flooring. The research team is now looking at combining the colour technology with wood hardening technology. The added properties would make New Zealand’s soft radiata pine more competitive in a wider variety of interior applications especially uses that require higher resilience such as skirting boards and outdoor furniture. Market research results showed that the unique look of the full colour thickness wood was interesting to all stakeholders interviewed, especially those from international markets. The biggest advantage of the full colour thickness product was the unique ‘look’. Described as naturally translucent and grainy, the guaranteed consistency of this look was a positive feature, as was the ability to pre-colour wood that could create potential for increased efficiency in the manufacturing process.